How often do we hear from the BBC about Britain's STATE TERRORISM? 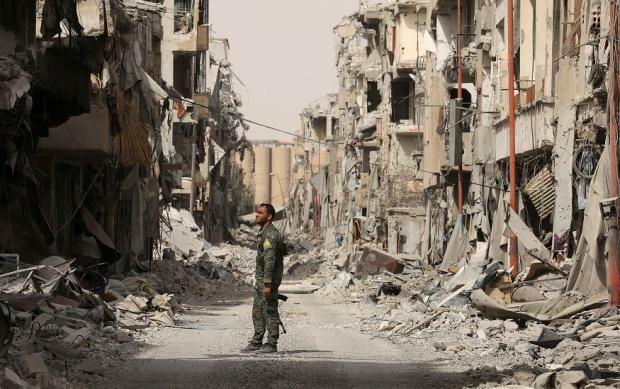 Does the British public have any idea of the havoc its military forces have caused in Syria? Britain drops 3,400 bombs in Syria and Iraq - and says no civilians killed. Royal Air Force drones and jets have dropped more than 3,400 bombs and missiles on Islamic State (IS) militants in Iraq and Syria, an investigation by Middle East Eye has revealed, yet the British government maintains that there is "no evidence" they have killed a single civilian. The vast quantities of ordnance dropped since the start of Operation Shader against IS in 2014 seriously undermines the claim by ministers that the RAF has not caused any civilian casualties in the three-year-long bombing campaign, and has prompted calls for an investigation. The Ministry of Defence does not routinely release statistics on the numbers of weapons used over Iraq and Syria, but an MEE analysis has combined weekly updates of operations in the region and information collated by campaign group Drone Wars. It shows that up to the end of September, UK forces had dropped at least 3,482 bombs and missiles in the battle against IS, including 2,089 Paveway IV bombs and 486 Brimstone missiles from Typhoon and Tornado jets. RAF Reaper drones have also fired 724 Hellfire missiles at IS targets. The figures are conservative as MoD updates sometimes do not specify the number of bombs or missiles used in a strike, and last night MoD officials admitted that a further 86 bombs and missiles had been dropped in recent weeks. The weapon of choice for RAF jets is the Paveway IV precision-guided bomb, but they have also fired large numbers of the more accurate Brimstone missile, which was originally designed as an anti-tank weapon but has been used extensively by the RAF to target IS snipers and vehicles. The government describes the Brimstone as the most accurate weapon available that can be fired by aircraft, and they are conservatively estimated to cost £100,000 each; heavier Paveway IV bombs are estimated to cost £30,000 each, and Hellfire, fired by the Reaper drone fleet, cost £71,300 each. 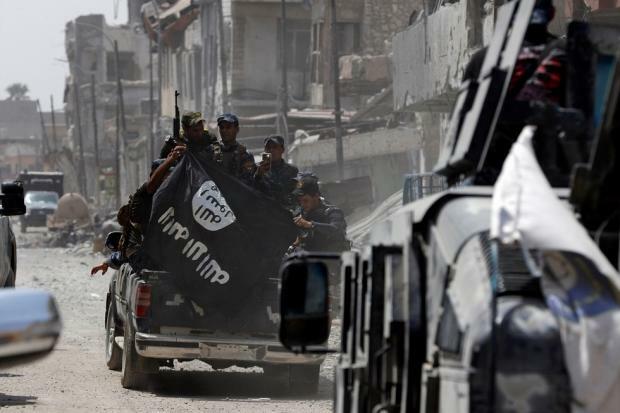 IS is in retreat in Iraq and Syria after a US-led bombing campaign that saw the RAF fly more than 8,000 sorties and kill more than 3,000 IS militants. A spike in weapons releases came earlier this summer, when RAF Typhoons and Tornadoes joined the coalition and Kurdish effort to liberate Mosul. Islamic State regularly used "human shields" in built-up areas, but despite this and the scale of the ordnance dropped by the RAF, the MoD maintains it has "no evidence" that its strikes have caused any civilian casualties - a position now roundly rejected by defence analysts and opposition parties. "Our armed forces are among the best in the world, so they will be among the most discerning and accurate when it comes to targeting," Liberal Democrat leader Vince Cable, told MEE. "However, it is, at the very best, implausible that our heavy involvement could not have caused civilian deaths. We must not knock our armed services, but, equally, the government has to be honest in its assessment of damage caused in conflict." The US Air Force, which leads the anti-Islamic State coalition, says it has caused 786 civilian deaths in the three-year air war, but despite saying the air war is the "most challenging fight in decades", the RAF has made so such assessment. Earlier this month, the minister of state for the British armed forces, Mark Lancaster, told parliament that the government "had been able to discount RAF involvement in any civilian casualties". The RAF says it takes all steps to minimise civilian casualties, but it has conducted more than 1,600 strikes in Iraq and Syria - more than any other coalition country except the US. Reacting to the figures, military aviation experts and campaigners have said that it is no longer credible for the MoD to maintain that has not killed any civilians. Samuel Oakford, a spokesperson for Airwars, a group that monitors civilian casualties from international air strikes in the region, told MEE: "The UK's claim that no British air strikes in Iraq or Syria have led to civilian deaths has always been difficult to believe. "Based on the coalition's own civilian casualty reporting, it is extremely unlikely that a coalition member as active as the UK would have not had a hand in a single civilian death. "As the campaign continues into its fourth year and more data about British involvement such as this is compiled, the MoD's claim is becoming increasingly absurd." Over the course of the last 12 months the focus of the air battle against IS, which the MoD calls Daesh, has shifted from the Iraqi city of Mosul, which fell in July, to Raqqa in Syria. 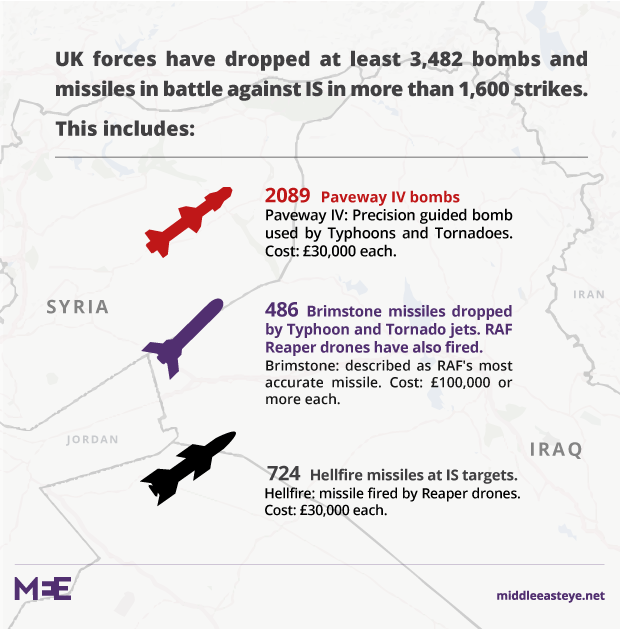 But MEE analysis shows that the overwhelming majority of RAF weapons released took place against IS fighters in Iraq with 3,000 strikes, while a total of 482 bombs and missiles were dropped over Syria, prompting fears of blowback in the UK. "Turning a blind eye to the consequences of air strikes and pretending they are somehow now 'risk free' is naive in the extreme," said Chris Cole, director of campaign Drone Wars UK. "Unless we begin to understand and acknowledge the true cost of our ongoing wars in the Middle East, we are likely to pay a high price in the future." Airwars, which works with the RAF and US Air Force to report suspected civilian casualties, says that at least 5,600 civilians have been killed by coalition strikes. In July there were reports that Iraqi soldiers used bulldozers to hide the bodies of hundreds of civilians killed in the final days of the battle for Mosul. MEE's analysis shows that during the fight for the Iraqi city, RAF Typhoons and Tornadoes dropped dozens of Paveway IV bombs on IS fighters in the city. However, the MoD does not have troops on the ground in the region carrying out battle damage assessment of sites struck by RAF munitions. Instead it carries out the assessments from video evidence captured from the air, a technique that has been dismissed as ineffective by other coalition allies. The RAF says it takes "all possible precautions to avoid civilian casualties", but Amnesty International has previously expressed serious concerns about the air war's toll on civilians. In a report earlier this year, it found the battle for West Mosul had caused a "civilian catastrophe". Civilians were being ruthlessly exploited by IS, which had moved them into conflict zones, used them as human shields, and prevented escape. They were also being subjected to "relentless and unlawful attacks" by Iraqi forces and the US-led coalition. A source in the RAF told Middle East Eye: "Given the ruthless and inhuman behaviour of our adversary, including the deliberate use of human shields, we must accept that the risk of inadvertent civilian casualties is ever present, particularly in the complex and congested urban environment within which we operate." The source added that all missions were "meticulously planned" and there was no suggestion that UK forces have committed war crimes. However, there are fears that by failing to fully address the issue of civilian casualties, the MoD is not presenting the full picture of Britain's campaign against IS. Iain Overton, the executive director of Action on Armed Violence, said: "If the RAF can claim zero civilian casualties, then the argument for more air strikes stands. "They can justify such by pointing at the issue of proportionality and IHL [international humanitarian law], they can claim that their kills are 'clean'. Perhaps they are, but they don't present the evidence to prove they are - not meaningfully." The MoD said in a statement on Wednesday: "Only by defeating Daesh for good will we reduce the threat to us here at home. British forces have crippled Daesh since 2014 and the RAF will continue to strike the terrorists hard where they plan their campaign of hate in both Syria and Iraq. "We have no evidence that RAF strikes have caused civilian casualties. "We recognise the challenge faced by coalition pilots in close urban fighting against a ruthless terrorist enemy that uses civilians as human shields, but are clear that to do nothing would leave cities in the hands of Daesh brutality. "We do everything we can to minimise the risk through the rigorous targeting processes and the professionalism of our RAF crews." Of course all this begs the question as to how 'Daesh' (as some now prefer to call it) was created from nowhere and supplied with (Toyota) vehicles and (American and Israeli) weapons and was not immediately destroyed by the West whilst still a relatively small and ineffective force? As we thought: Christopher Bollyn shared his post to the group: Friends who like Solving 9-11 Tour. orders that would eventually culminate in their being on board four regularly-scheduled flights originating in Boston, Washington Dulles, and Newark, New Jersey on 9/11.